Our repair shop is equipped with cutting edge technology and specialized machinery designed for club customization, analysis, and repair, and all repairs are done by Scott Denil, a certified master club builder and a certified master club fitter. 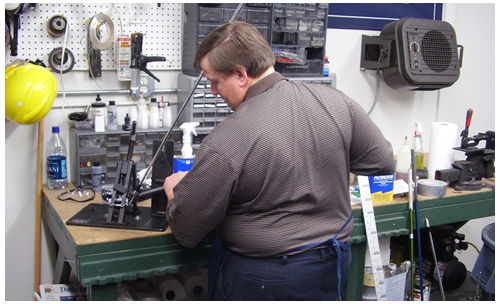 Scott has been doing repairs since 1979 when he started as an apprentice under the supervision of a PGA Professional. Scott continued to hone his skills over the years to include spending time in the PGA Tour Vans learning the lastest tips and skills used by the manufacturers. OTHER as necessary or requested. Regripping for a single club or a full set is available. Proper grip size does matter and it is important for you to have your grip size measured. Often clubs purchased off the rack come with grips that may not fit your handsize. The wrong size grips could cause incorrect shot patterns. Worn out grips also affect your shot, distance and control. Have your grip size measured, check out the newest grips on the market and choose from a variety of products. Reshafting for a single club or a full set is available. Discounts available on full sets (minimum 8 irons). Have your swing speed tested and discuss your swing tendencies and learn about the newest shafts on the market. Choose from a variety of steel or graphite shafts from such manufacturers as True Temper, UST, Graffaloy and others. When getting frustrated with some of your shots, it may not be the clubhead but simply a shaft that fits your swing characteristics that may help you out. Do you want to hit straighter shots? Does your ball flight tend to go left or right of the target? Do your divots look heavy to one side or the other? Do the ball marks on the clubface lean towards the heel or tow of the club? Simple loft and lie adjustments can correct all of these errors. All loft and lie changes on irons or putters are completed using Mitchell Loft & Lie equipment.